So I was headed down to my lunchtime beach retreat with some plans. I wanted to do the Hermetic purification ritual from the Black Work course and follow it up with one of the purification techniques from Jason’s new course and engage in some brief prayer and meditation. I had some extra time before my next meeting, and had everything prepared so I had a little bit of extra time on my hands. Of course today the beach is occupied. I was annoyed. Of course it’s there for everyone to enjoy, but I had Important Plans dammit! Grumpily I began walking through the forest back to civilization. 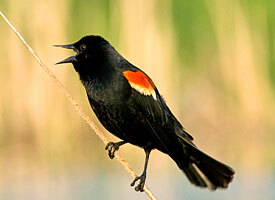 On the way back a Red winged Blackbird alighted itself on a flimsy reed next to me. If you’re not familiar with these birds they have the uncanny ability to be able to perch on seemingly anything, even things which don’t looks like they should be able to support their weight. It’s magic! Yes, yes it’s pretty awesome. And there it was. If even for the briefest moment, mutual appreciation of the wonder and beauty of this world, with the mind of god itself. The resulting feeling was almost enough to literally send me to my knees right there. Even in remembering it, the feeling almost overwhelms. A most important reminder today; in the midst of all the incantations, learning, and initiations, this is what it’s all about. This entry was posted in Druidry, Hermetics. Bookmark the permalink. I had a monarch butterfly cross a parking lot (I watched it), go around me in a spiral from my feet all the way up, spiraling about 2 times around, and land on my nose then leave. It had been a very stressful day in my life. Even now when things get very down, and the weather is permitting, a butterfly will land on me. For the first time in YEARS, today, the day after I read this blog entry, I hear the gorgeous call of these birds. And then I thought about them – perching on the ribbon-supple leaves of a cattail. The bird doesn’t fall, the leaf doesn’t bend. “Koooo-WEEEEEIIIIK!” which, this time, sounded suspiciously like laughter.